Thailand is a warm and welcoming country, famous for many things; from the lively and fruitful attractions of Bangkok, to the ‘Phuket Fantasea’ Theme Park located just East of Hat Kamala. Something many visitors seem interested yet unsure of however, are the abundance of street food vendors and the interesting delicacies that can’t be found elsewhere. Being in a foreign country is bound to put travellers in a cautious state of mind, but to miss some of the most unique and incredibly diverse tastes available from these makeshift stalls may result in massive regrets. 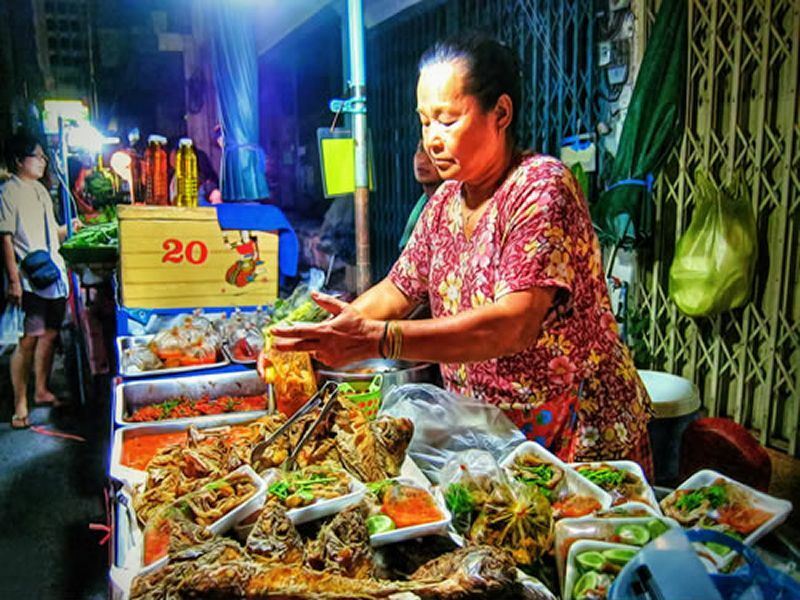 Street food vendors can be found all across Thailand, often in town centres and areas which are heavily populated by the hungry and hard working community. The carts are usually set up outside stores after they are closed for business; once the protective shutters come down; the carts arrive and set up shop. Any popular town or market centre is bound to have food carts arrive day and night, to deliver an array of snacks and extremely different tasting dishes to anyone who wishes to enjoy the ultimate taste of Thailand. Surprisingly, it is very rare that even tourists not used to the diverse flavours and ingredients get ill from eating food bought from food vendors. This is because the freshest of foods are bought by the vendor from the market every day to prepare the food they sell. Less can be said for larger ‘chain restaurants’ that have large walk-in fridges; as they often try to make stock last longer and so will wrap up unused products for use the next day. Street vendors do not have this luxury; a fresh batch of meat, fruit and vegetables are used each day to create delicious (and hygienic) dishes. There are enough food carts around for you to be able to browse their stock and find a meal that is sure to tantalise your taste buds. Both hot and cold foods are available, and most vendors will supply you with a plate as well as utensils with which to enjoy your meal. You can find all types of sweet and savoury dishes to satisfy any cravings; from the dessert carts offering delicious treats for those desiring sugary treats, to barbequed squid and poultry dishes for the ravenous meat eaters! Most dishes are amazingly priced; you can expect to pick up large portions of culinary delights from the majority of stalls for between five and ten baht (around twenty British pence). You can certainly enjoy the most amazing three course meal for less than a pound! For a true Thai dish, look to the stalls that have large bowls and vats of curries and soups; foreigners don’t normally take away the large portions available here, but if you are staying in an apartment or with a friend and have the convenience of a cooker for warming, taking away a bag of curry will feed a group of four easily. Be warned however, Thai dishes can be extremely spicy, so try a small taster before you jump whole heartedly into your dish! The variety of authentic cuisine to be found when shopping around Thailand’s street food vendors can enhance any experience to Thailand. As a large part of their culture it would be rude not to try some of what they have to offer, and we are pretty sure that you will be delighted with any of your choices! Further reading: If you're interested in discovering the best of the best dining experiences in Bangkok then read our top 10 restaurants in Bangkok. Article written by Steph Staszko.